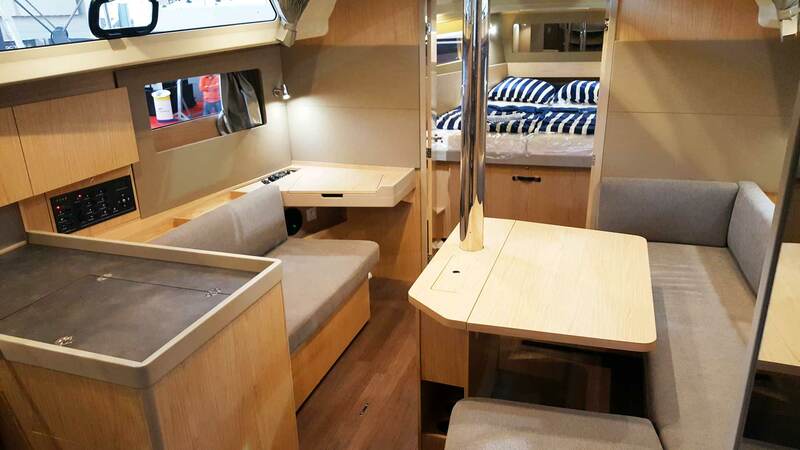 As you may have read in one or two of my articles on the refit project of my own King´s Cruiser 33 sailing yacht a lot of effort goes into the refurbishment of the boat´s interior. That´s because my 40 year old ship hasn´t lost any of her undeniable sailing qualities, but therefore a lot of her appeal and appearance. Though most of the works done is cosmetic, I often wonder which way is the best, how to do this and that the right way in order to keep the King´s Cruiser´s character on the one hand and to achieve a modern approach with a yet classic appeal in re-designing her internal fitting. 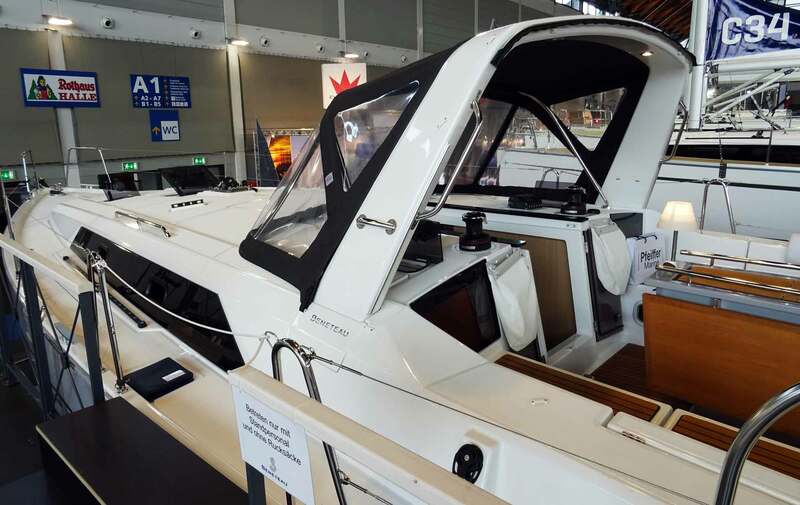 Strolling around the various boat shows is a welcome inspiration. Such as the Interboot Friedirchshafen, where I was able to spend two days. This article is dedicated to showing some interior design concepts of a handful of boats I visited on the Interboot. 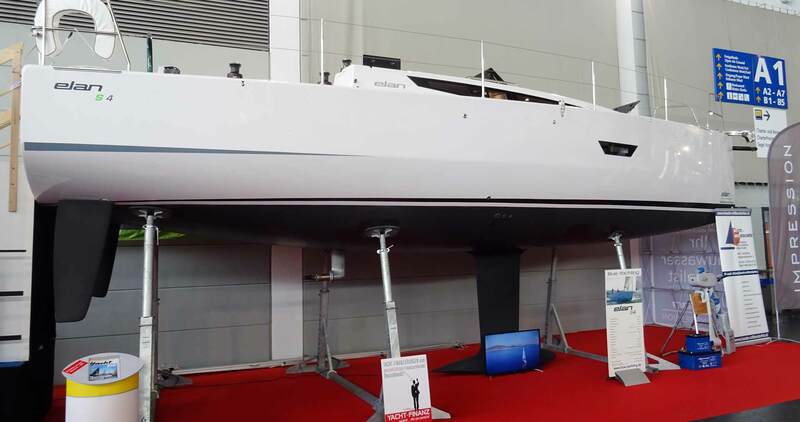 Maybe I can draw some inspiration from the solutions done by the big brands like Beneteau, Jeanneau, Dragonfly, Hallberg-Rassy, Dufour or Dehler. 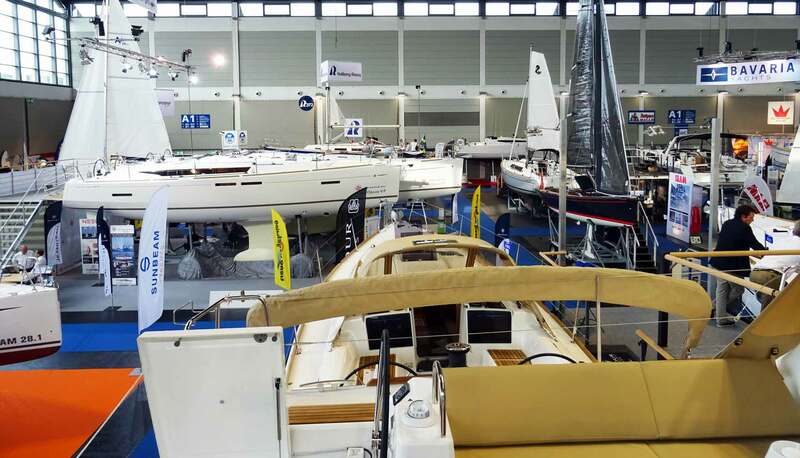 Some 90.000 people have been attending Interboot fair this year, situated at the Lake Konstanz, a huge inshore water marking partially the border between Germany, Switzerland and Austria. Though the emphasis of the Interboot is on smaller vessels, mostly Daysailers, there have been quite a handful of bigger ships meant for serious offshore sailing: The charter sailing areas of the Adriatic aren´t that far away. Here´s what I´ve noticed: I´ve visited nine different boats, 4 of them in this first article, another 5 in the upcoming Part 2. 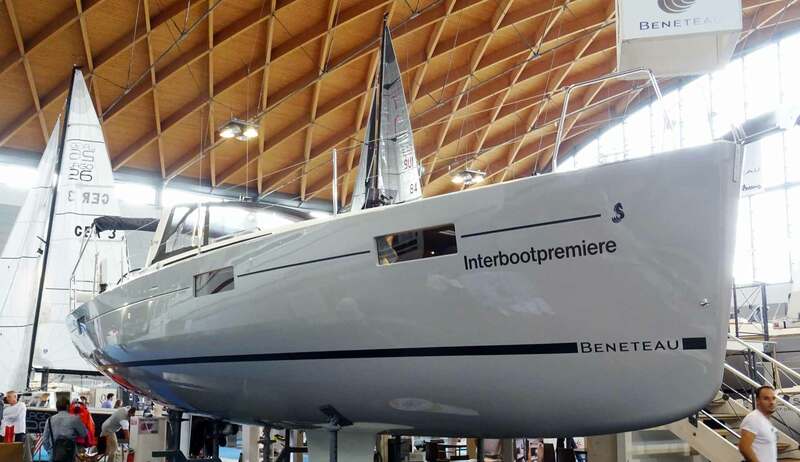 I was very much interested in seeing this boat as Beneteau is undeniably the market leader and the yard with the highest output of production sailing yachts worldwide. So I bite the bullet and put myself in the queue to get a glimpse of her interior design. The Beneteau Oceanis 45 is some 14 meters in length over all, has a maximum beam of 4.50 meters and a displacement of some 10.5 tons. That´s quite a punch. By waiting in line I could inspect her outward appearance. Well, she is a big lady. Not very distinctive lines, nothing really exciting for one´s eyes to get a grip on. The huge portholes seem a bit oversized to me, the cabin´s superstructure is round shaped in a convex line which appears unnatural. Lots of plastic and no teak decking whatsoever. All in all her appearance was … well, not very glamorous. Worst about her outward design was the targa bar, hosting the mainsheet traveller as it is costumary on all Oceanis variants right now. 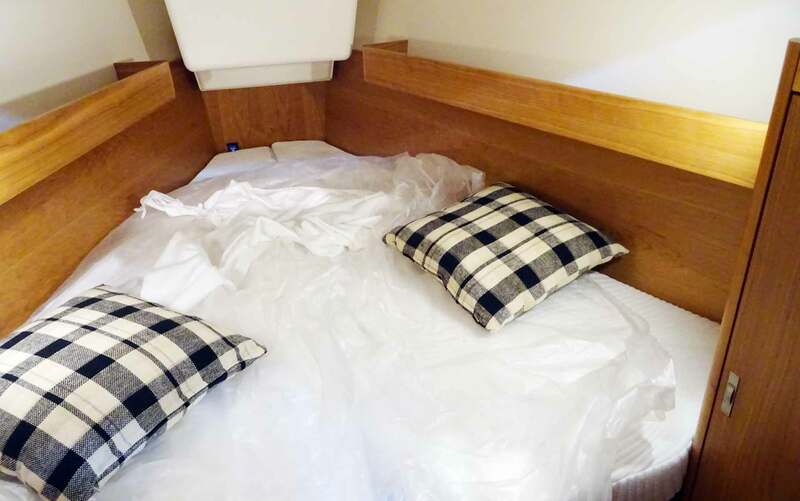 It may be perfect for Bimini fixing, but believe me – especially in combination with the huge sprayhood – it looks overdesigned and really awkward. Well, let´s go inside. Since this 45 feet yacht is a big fellow and no matter if owned by an individual or used by a larger group of people on a charter cruise, 45 feet should be more than spacious. But upon entering her saloon I was instantly disappointed, because I really couldn’t develop a sense of spaciousness at all. I really don´t know if that´s due to the color-scheme of that particular boat (50 shades of coffee-brown) or due to the layout of the whole interior, I couldn´t get a feeling of coziness here. Entering the saloon from the companionway there´s a galley to port side and a saloon. A U-settee on starboard side with a folding dining table and a 2-person settee to starboard side, of which I´d like to talk later. 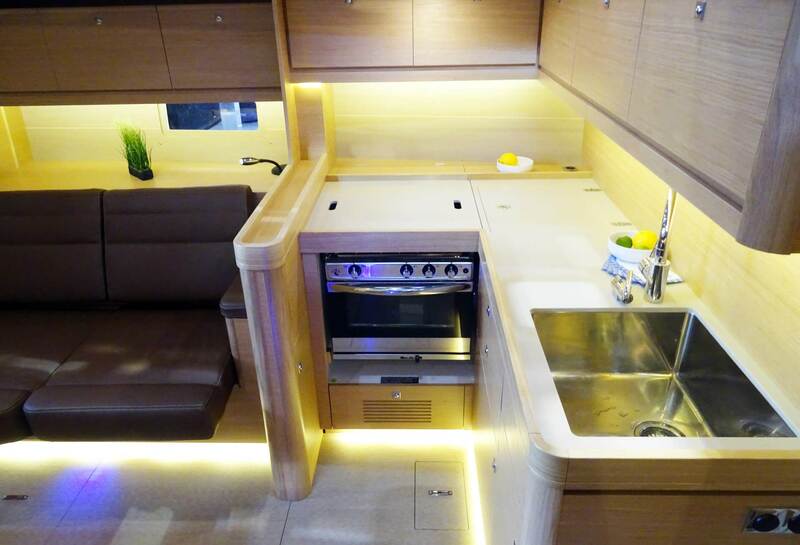 The L-shaped galley offers more than enough space for cooking and working the plates, a large fridge and a 2-flame stove should be more than enough. 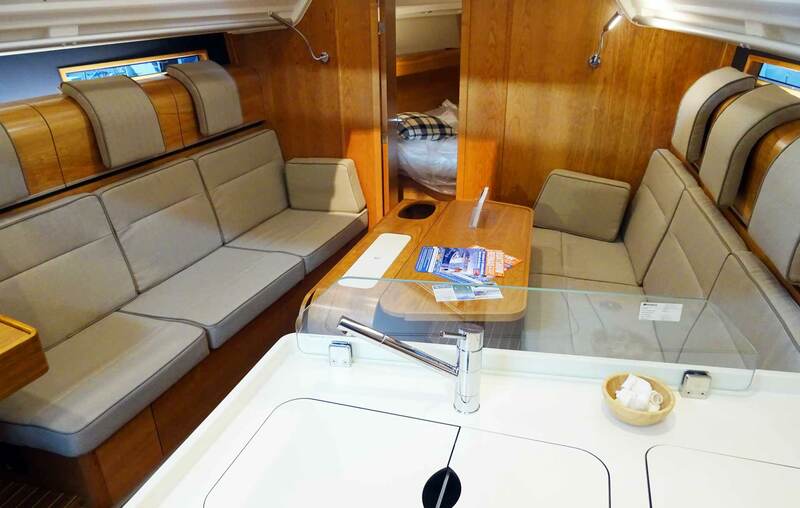 Stowage is plenty of available, so that´s a plus for the Beneteau 45. Vis-à-vis a large head with shower can be used by the crew. But let´s go back to the saloon concept as it is the most remarkable – and awkward – detail on that boat. By taking a closer look to the starboard U-settee I couldn´t help but shake my head: For my taste there´s absolutely nothing at least trying to appeal my eyes: The portholes are far too big, the veneer providing cover for the porthole has an even bigger porthole-outlet creating a feeling of being unfinished. The walls offer no structure at all and I felt battered by the sheer vastness of dull brown and grey colors. I know, well – I hope – that owners could choose other fabrics, colors and hopefully wooden veneers too, but this particular configuration and design didn´t appeal to me at all. Which is a pity. 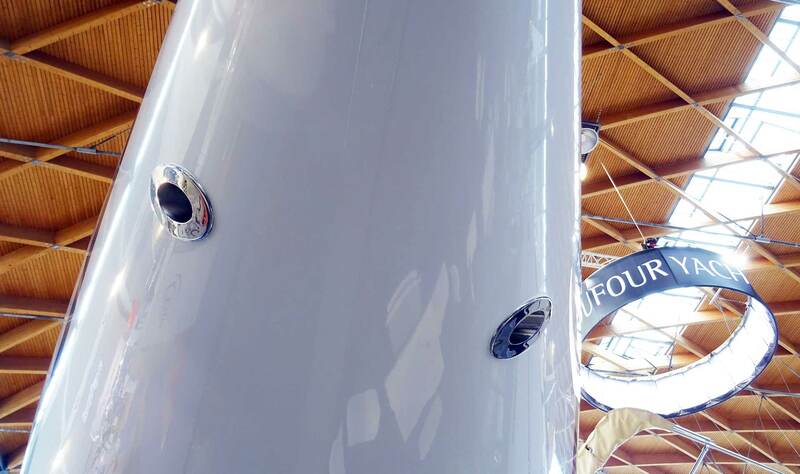 Learning for the design of my own boat: A ship´s internal fittings should at least partially be of wooden materials. In this sense, the new Beneteau 45 is just too modern for me. But that wasn´t the only awkward thing about the boat. Spending lots of time to think about the perfect navigation station on my own boat and in designing and building the perfect chart table I am always particularly interested in the solutions of contemporary yachts in these terms. The Beneteau 45 was in this case a real runaway: Why would a ship´s designer put the chart table to the farthest place away from the companionway? Why would the same designer put the main electric control panel on a totally different position? As it was done on the Beneteau 45. I think it´s crazy: Upon taking a look onto the charts, the skipper must reach through all of the length of the saloon to get to his chart table, mounted on the bulkhead to the fore peak, reach back all the way to the companionway. To check for electric status, the panel is mounted farther back in the saloon, so he has to get up again from his navigation station. I just couldn´t grasp it. The only reason why one would design such a thing is – skipper´s chart work isn´t considered important anymore. Besides, standing in the fore cabin door looking aft I again couldn´t get a sense of being inside a 45 feet ship: The saloon really does not mediate a roomy spacious sensation: More to the contrary, I had a feeling of being somewhat constricted. Big enough. But again: Dark. Darker. 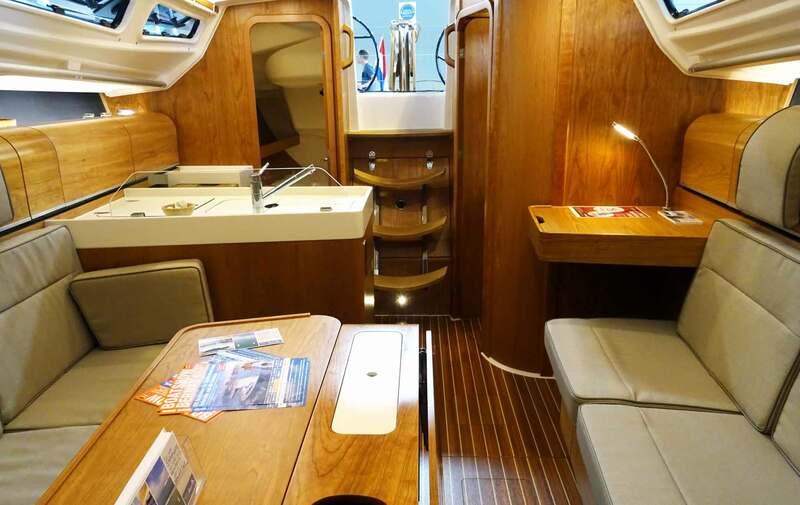 The aft cabins of the Beneteau 45 are huge. 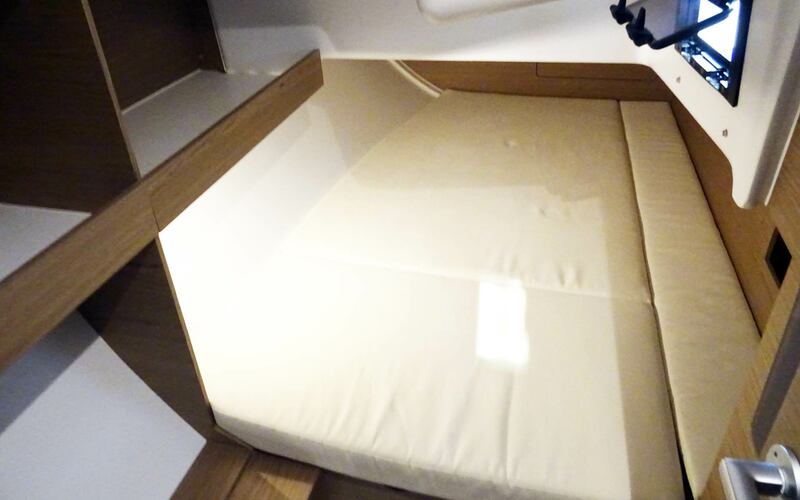 The berths, or should I say beds, offering more than enough space to find a good night´s sleep. Again, huge portholes allow a wide view to the sides of the freeboard though I would have gone for more (yet apparently smaller) portholes which could be therefore opened for fresh air. Again, some of the practical solutions appeared cheaply done, such as the sheathing of the hull which is simply a thin bent board screwed to the boat. Some of the other fittings such as stowage and cupboards did seem to be made with good quality joinery as well. At last I found the owner´s cabin in the fore peak emptied of other guests and took my chance. 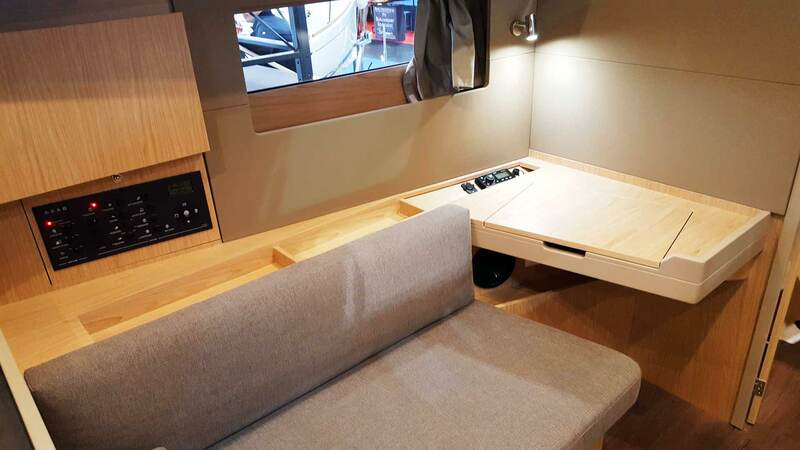 What I really like is the huge, partially foldable forward bulkhead which will open up more than just a narrow door to the fore cabin but a wide passage – thus creating a roomier feeling. This was seen also on the Dufour Grand Large 310 I´ve visited some weeks ago, where this effect can be seen in a very spectacular way. 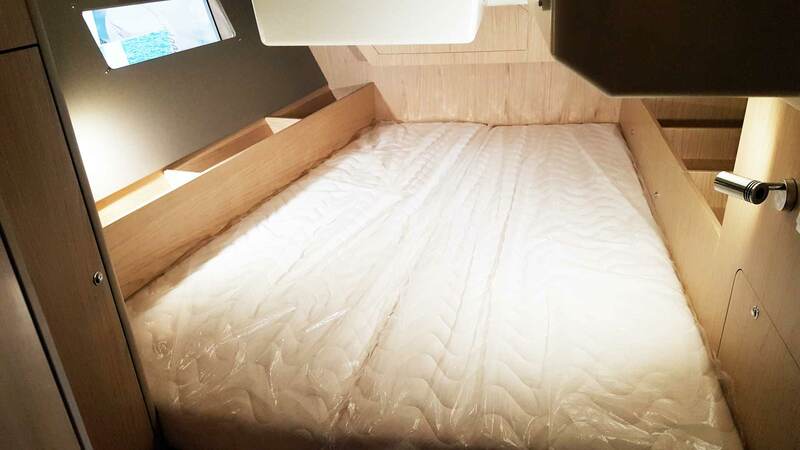 In the Beneteau 45 the fore cabin is really more than appropriate: The master bed is huge, as well as the portholes again. Enough stowage available in two big cabinets as well. All in all, I must rather say, this boats didn´t appeal to me at all. I just couldn´t get warm with her internal layout, the floor plan seemed sometimes crazy (see navigation station), color scheme and some of the practical solution created a cheap sensation. 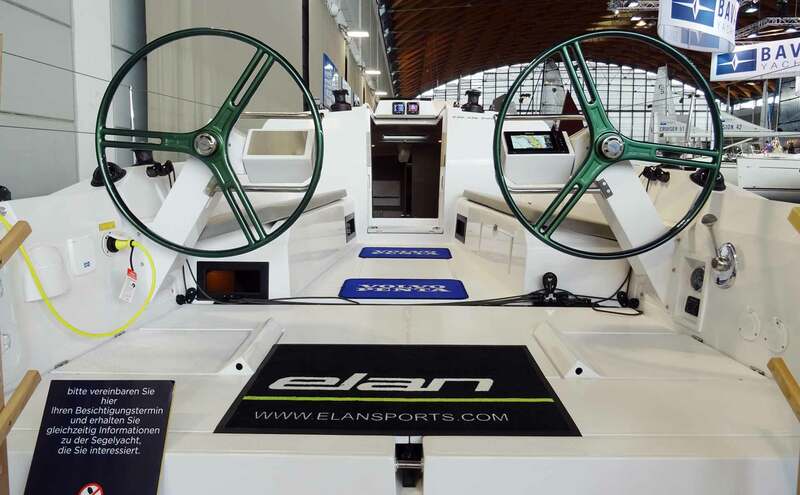 Elan yachts are known for their sailing characteristics, renowned for speed and synonymous for cruiser-racer with style. Upon entering the stand of the S4 I took some time to admire the lines of her hull: Sleek, aggressive with distinctive chines, a racy bulb keel and twin rudders create a sensation of speed and power. That boat really lives up to the brand value and I was excited to be allowed to inspect her interior. 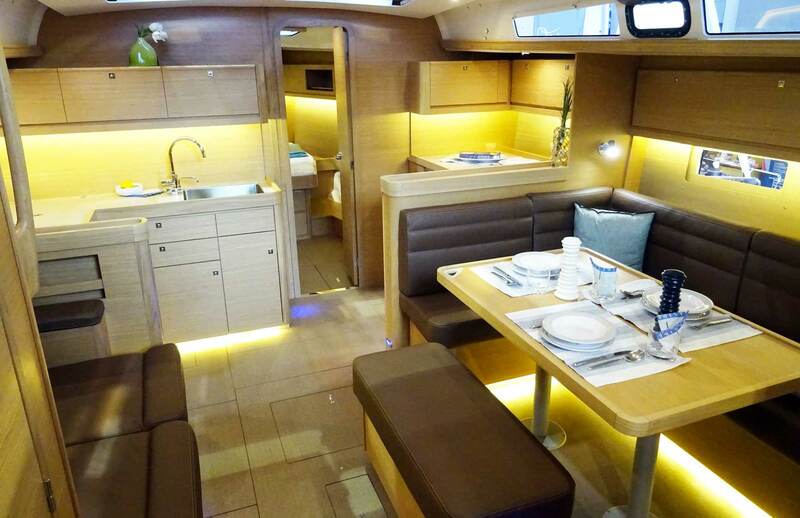 How is an Elan S4 sailing yacht appearing from the inside? Racer-cruising with style – let´s check it out. Again, I must admit, I was partially disappointed. I instantly got the feeling of being in a kitchen. There are cupboards installed all over the saloon circumferentially, white colored with a decorative band of reflecting mirror-like metal. That created a mixture of kitchen, medical practice and furniture store. I am sorry, but the choice for the saloon´s fabrics, colors and styling elements was a clear overshoot in my eyes: Too much of everything, too much of a medley of too many decorative things competing for the beholder´s eyes. Which is a pity, because the floor plan is a classic. 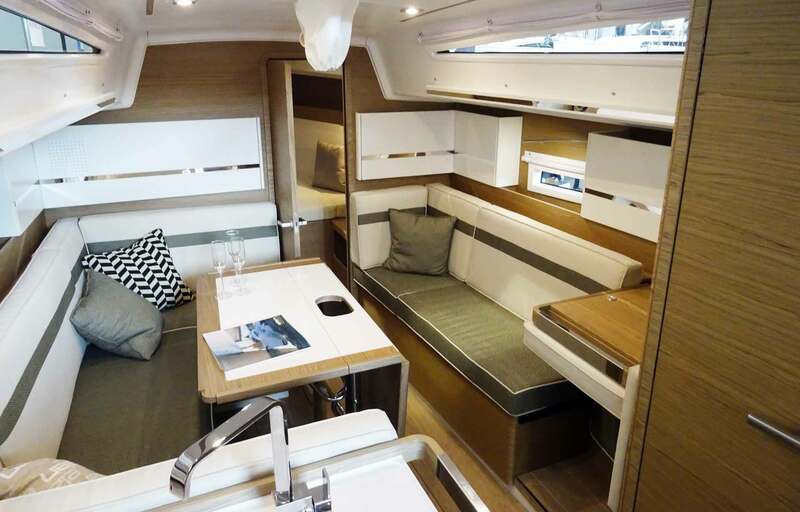 I hope owners can configure their Elan S4 boats in way that the saloon could mediate a cleaner, homogenous and more relaxing atmosphere! 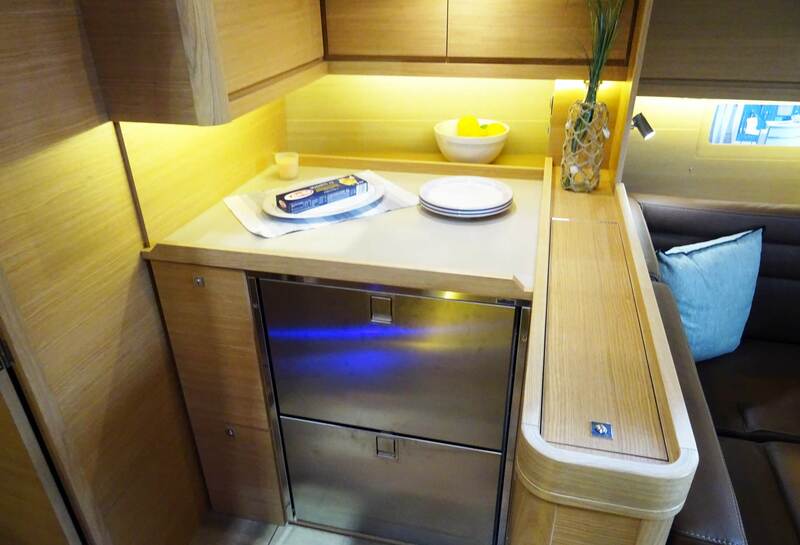 On the other hand, a definite plus on the Elan S4 is the huge galley. Rounded edges, a nice arrangement of different materials and the joinery did satisfy my demand instantly, more so, it made up partially for the jumbo-mumbo of designs of the saloon. The galley offers more than enough space. 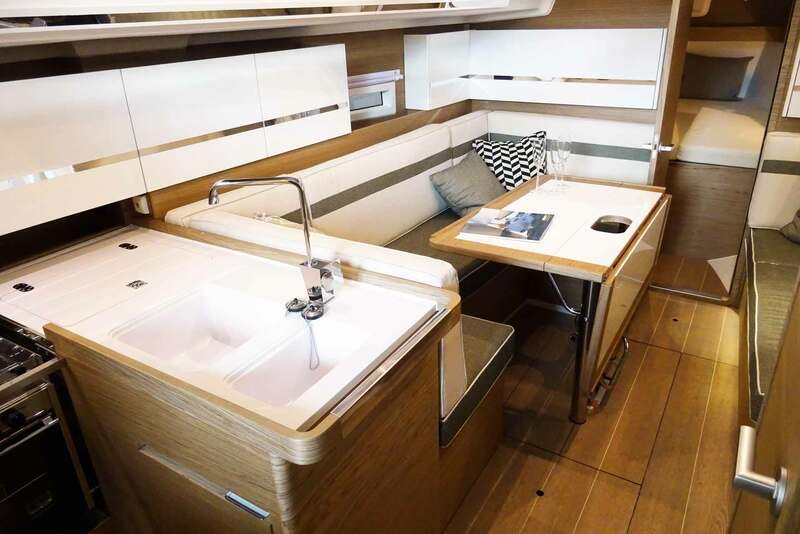 Compared to the Beneteau 51 I did had the feeling that although being some 10 feet shorter and therefore having less space available, Elan´s designers managed to get out a lot more spaciousness than their French counterparts. The rear cabin was a bit of a disappointment on the other side. Though wooden veneers have been installed plenty of and made a nice impression, I was puzzled of the Elan S4 offering so much ordinary shelves instead of proper cabinets. I would assume this boat going at a high speed with quite some heeling: Open shelves, especially these really big ones, won´t hold to their contents. It´s frustrating to find one´s stuff spread over the whole cabin after a day of rocky sailing. 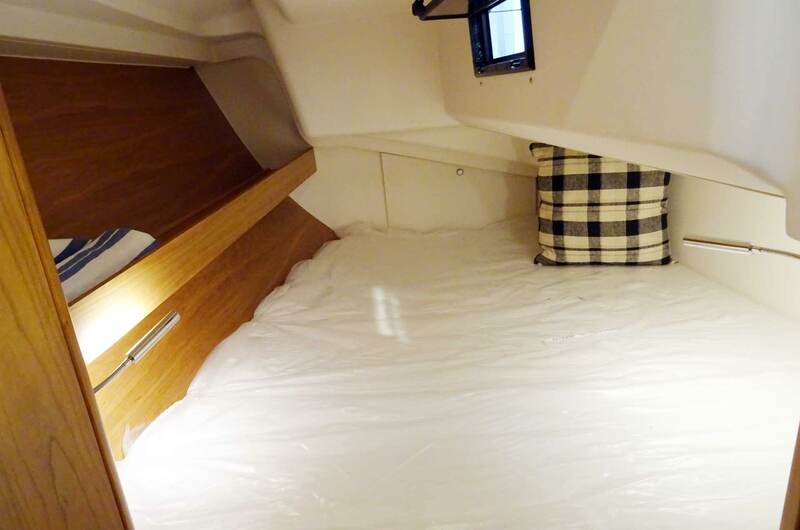 On the other hand, size of the berths seemed adequate, same as to her opening hatches for fresh air. Shelves. Shelves. Shelves. No cabinet? All in all I must admit, the interior design solutions seen on the Elan S4 couldn´t really win my enthusiasm. Though the floor plan and overall layout did really appeal to my eyes, there have been too much decorative elements competing with each other, too many lines running through one´s sight creating an unsteady feeling. I don´t think I could calm down and really relax in an Elan saloon. A big minus are the huge useless shelves, I hope that there is an extra package to order proper cabinets. Nevertheless, I´d love to sail one of these. Standing in the cockpit I suddenly realized that these boats are primarily made for sailing and that was the feeling I instantly got by placing myself at the helm. 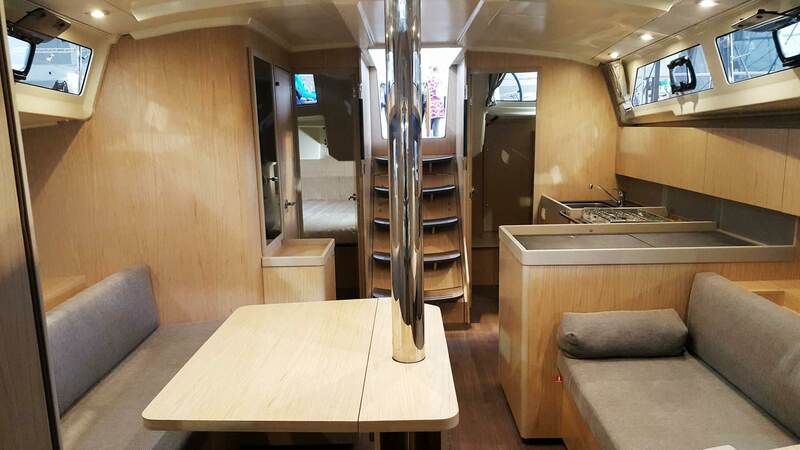 There is no decking or teak applications to be seen anyhow (though it certainly is part of the extra packages offered), multiple stands for safe and sound foothold whilst sailing and the large mainsheet traveller right across the cockpit floor talks business. 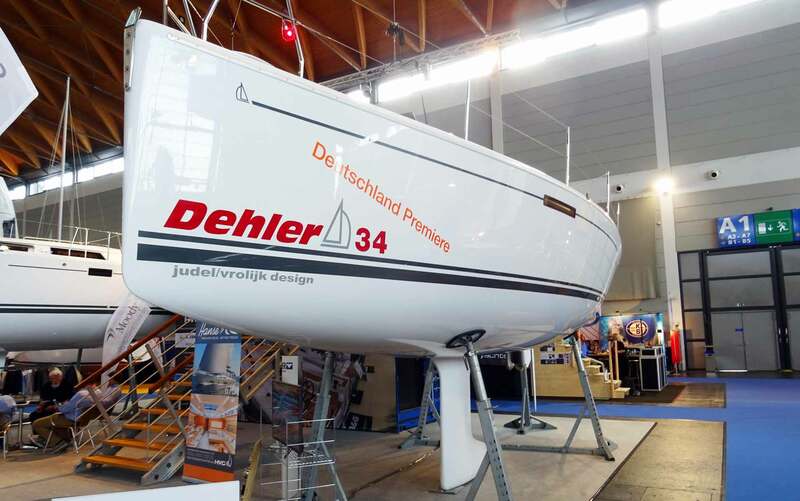 That was a real hype in all those print magazines and high glossy boating gazettes when Dehler launched its latest model: “A Legend is reborn”, as it was said. 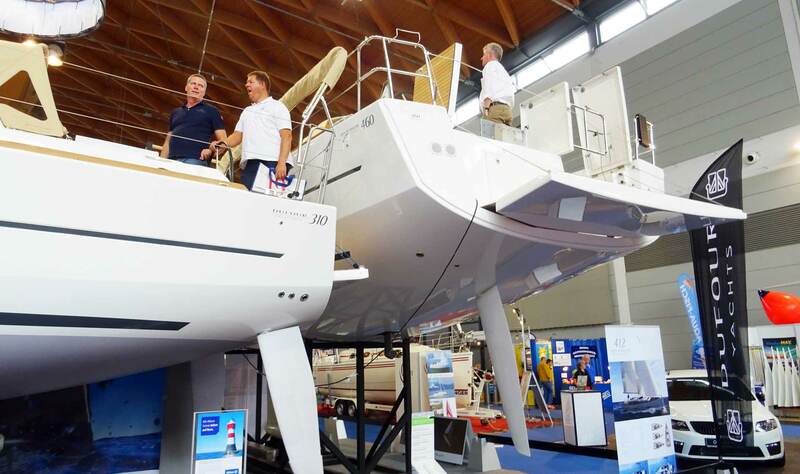 And right they are, expectations are high since the old Dehler 34 has been one of the most successful and trend-setting yachts for the your Dehler company back in the good old days. Looking at her from the outside I instantly liked her clean sleek lines. I was very keen on inspecting her interiors. 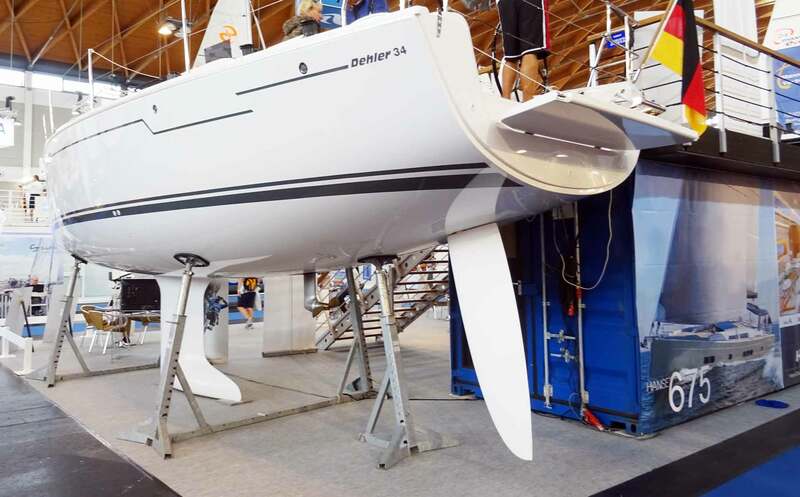 The same tension I did have upon getting to see the new Dehler 42 cruiser-racer some weeks ago (read that particular article here): Dehler is part of the large Hanse Group but wants to retain a certain stand-alone character. And the big company is good advised to let them have – Dehler has a reputation of making very well sailing fast yachts with an emphasis on good quality when it comes to internal fittings. Looking at her stern it seems a bit odd: When all the others, even Beneteau, are springing for “modern” chines and twin rudders, the racy Dehler does not feature any of them. There´s a huge single rudder, a somewhat ordinary keel – though a bit deeper than normal cruising keels – and that´s it. I wonder what sailing this boat might be like. So I climbed the stand and asked for admission to enter the boat, which was granted. Just L-O-V-E the design of that awesome saloon! Wow, classy again! Her saloon is just wonderful. There´s lot of wooden fittings, nicely done and I really liked the fabric of the cushion. Colors are in harmony with each other, there´s no frills around and everything is done with an emphasis on creating a real ship-like atmosphere. No time to think back of the overdressed Elan or the wannabe Jeanneau. This is real good interior design! Modern yet stylish, ship-like yet inviting. That´s my kind of taste indeed! The saloon is classic: Two settees on either side, a large foldable dining table in the middle. That´s it. The Dehler 34 has a maximum beam of just 3.60 meters. A slim boat. We remember: She was built to sail fast. And that’s why there´s no U-settee or other gadgets in the saloon. I can vividly envision a crew taking a pause down below deck from an exhausting sailing day out offshore. Upon entering by coming down the companionway the sailor will find a small L-galley to the starboard side, vis-à-vis a head with a separated shower. The saloon features a small navigation station facing aft which I guess is a concession to modern sailing yacht interior design. I took a seat and tried to imagine myself doing chartwork at this chart table, which is possible, but could be a bit tricky since the worktop is rather small for my taste. Again, big enough navigation stations are a thing of the past, I guess, after most of the sailors will stick to their huge multicolored digital displays. What I really liked at the Dehler 34 navigation station was the rounded cover for VHF and electric switch panel. By the way, all the rounded headrests, reminding me of a private jet or something, are folding offering a lot of stowage here. Aft cabin will do as well. Aft cabin was huge for a 34 feet boat. I even felt kind of bigger than that of the Beneteau some 10 feet larger, but that might be a fallacy. 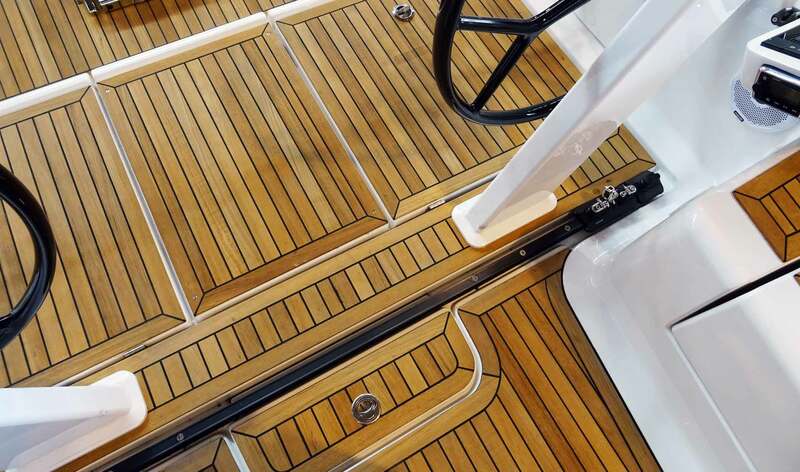 What is fact is that – also contrary to the Beneteau – the quality of craftsmanship seemed a lot higher in the Dehler. Veneers made of nice material, and a real cabinet with closing doors did appeal to me very much. Somewhat cheap, I must admit, the owner´s cabin. 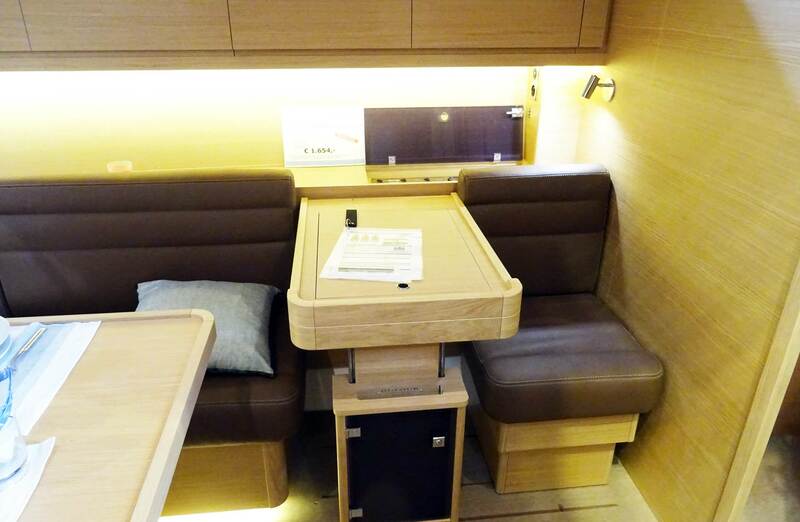 Not so much due to her size – the fore peak is slim – bit due to the fact that white plastic surfaces dominate this cabin. 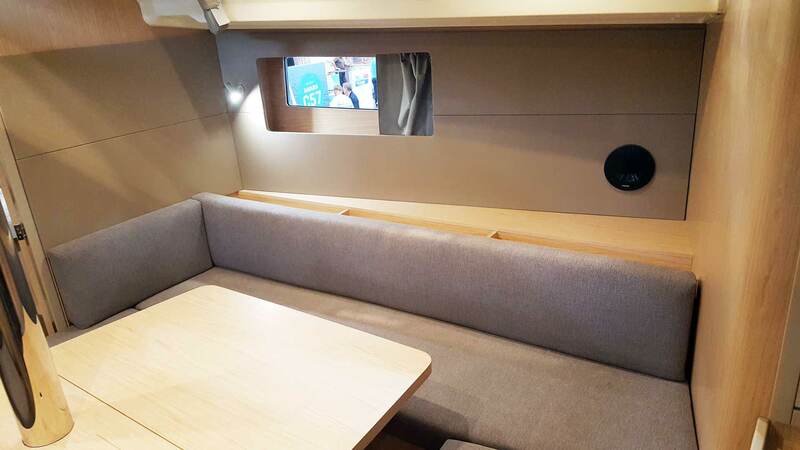 I would have gone for a wooden panel or kind of veneer for covering the collision bulkhead, maybe added a mirror or something to optically widen the feeling of space in this cabin. Nevertheless, I loved the Dehler 34. She might be quite a stormy sailing yacht, I just don´t know, but as her bigger sister, the Dehler 42, was already announcing, Dehler´s interior designers have made a wonderful job in creating a very likable saloon, minor drawbacks in the fore cabin put aside. Since I got the chance to inspect the Grand Large 310 (read the article here) in Germany I got more and more interested in this French brand. Dufour is a widely known name in Germany, but few are to be seen at the jetties and it seems that most sailors I know don´t really have a clue what a Dufour is all about. And yet, Dufour is building sailing yachts since more than 52 years and the boats bear an image of being good responding, fast boats with an emphasis on luxurious travel. Here we go – the Grand Large 460. Her hull is indeed one of the biggest boats to be presented at the Interboot and as I roamed her rudder below the waterline I noticed her flat bottom and sleek lines. Made for speed? I climbed the stairs and had to wait some minutes to be let inside since Dufour´s stand was funnily enough crowded with people. But when I was granted entry and I once got down below deck, I must admit, I couldn´t barely find words. This is just w-o-w.
First of all, the saloon was that spacious, that I was climbing out of the boat instantly and checked for the boat´s size. Just to be sure: This was a 46 feet yacht, having nearly exactly the size of the Beneteau 45 and yet the feeling of space inside the cabin was so much greater. Is it? The Grand Large has a max beam of 4.50 meters. So that´s exactly the same available space, yet they can squeeze out so much more room. The Dufour greeted me with a dancehall-like space upon arriving in her majestic main saloon. But despite the roomy feeling, it offered a lot more. Look at this huge, huge space available here! Floor plan of the saloon just seems to be classic – a large L-settee on the starboard site faced by a 2-person settee vis-à-vis. But let´s look at the details: The large dining table isn´t foldable. Why? There´s so much space available. A stool that could accommodate 2 people in front of the table. I don´t know if I would like the stool to have a back rest, since without it one could use it for both sitting at the table and just taking a seat “by the way” facing the other settee in a short pause. 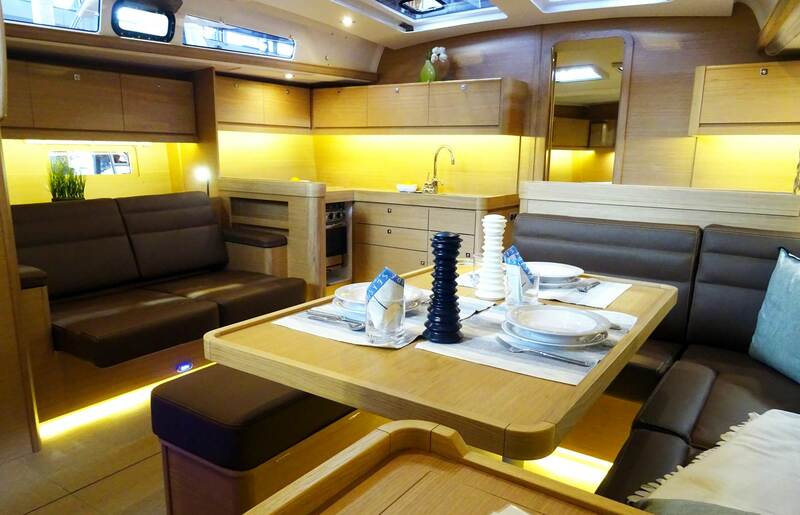 What really sets the Dufour Grand Large 460 apart from all the other boats I´ve seen so far is the galley. It´s just awesome. 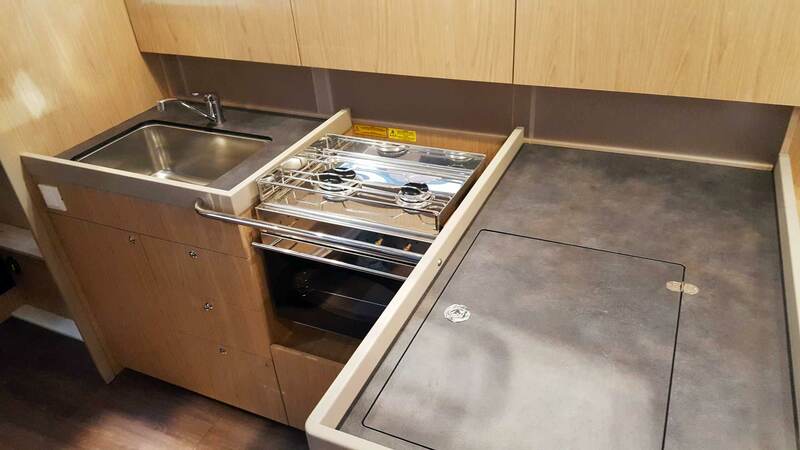 … because right on the other side of the galley, starboard, there´s another part of it, featuring no less than two more fridges for beverages, another large worktop and stowage as well. This secondary galley is again separated from the “living area” by a stand, I suppose this is where a retractable TFT could be mounted (which was not in the boat I visited). Okay, that´s a lot of galley stuff here, and one could argue that a retractable TFT as well as all the integrated LED-lighting is a lot of bells and whistles. Well – it is indeed. But you know what? That was the first boat that was living up to its promise of travelling “in style”. Lots of it. Lots of it I was seeking to no avail in the Beneteau. But the Grand Large appears to be a real sailing ship too. Dufour yachts have the reputation of not just being nice for the mooring party at the Saint Tropez jetty but of being quite capable sailing boats. An indication is the first real practical solution for the navigator: The chart table and navigation station has been done with care. Again, the chart table didn´t had the size I would wish it has, but it is adjustable to heeling, which can be a great plus offshore. Main switch panel and VHF are – of course – within reach. Best thing: If the sailor has no need for the navigation station, it can be moved away completely. The table can be moved aft as it rests on kind of rails, as well as the small navigator´s stool, that will go forward. This way, the settee becomes even longer. 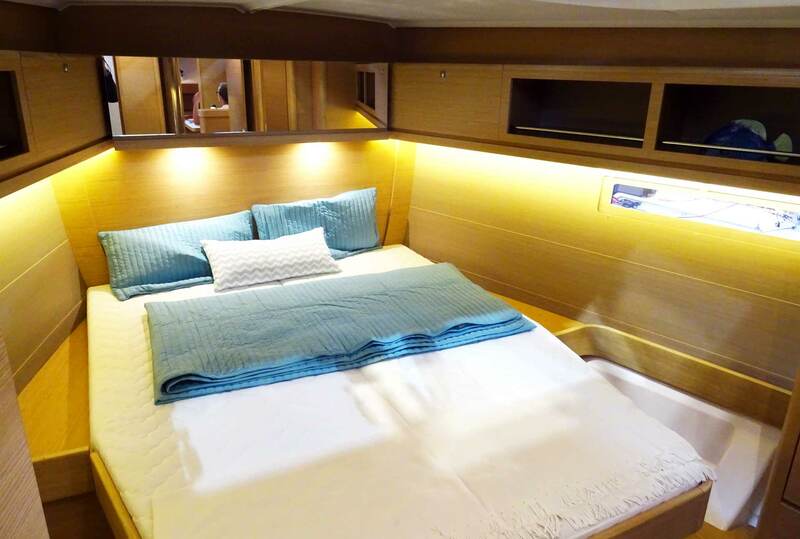 All cabins of the Grand Large 460 offer more than enough space as well as stowage – both cupboards, shelves and cabinets. The bathrooms (and I´d like to call it bathroom, not head) are again huge and seem to be made with great care for craftsmanship and choice of material. 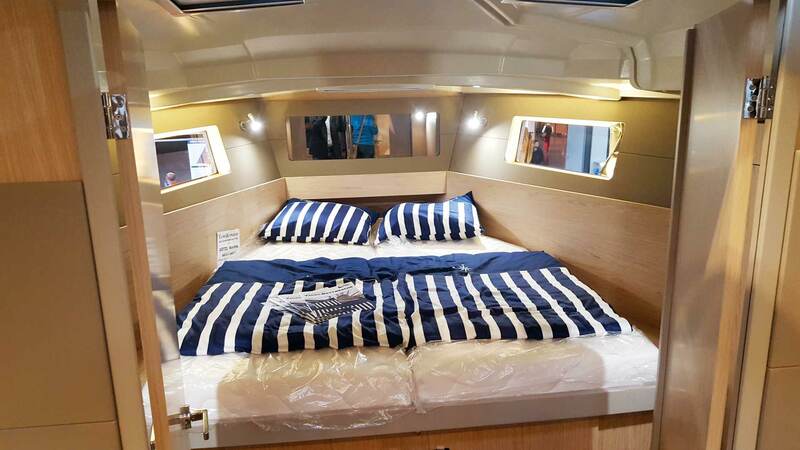 The berths, or let´s name it: Beds, are long and wide enough even for tall people, I particularly liked the owner´s cabin of the Dufour. Everything is covered with wooden panels, there are shelves all around for the small stuff, cupboards and cabinets overhead and to both sides of the entry door. A mirror at the collision bulkhead creates visual space. Bravo! I´d like to see that boat move under sails. Maybe that´s something I am going to do next season, as this boat is really an interesting one. Concerning maneuverability, Dufour seems to be putting forward a new technique called Jet Thruster which basically works by pumping water through a throttle to create thrust for maneuvering. Smaller system, no water intake (and all that stuff floating with it) like with the old thruster systems and a steady stream of water to create constant thrust. Interesting. All in all, the Grand Large 460 was a very interesting boat and one of the most beautiful in terms of design. I personally would let away all those bling bling LED and other “luxurious” parts but floor plan and the outcome of designing that boat and making the most of the available space is just awesome. Designers have made a marvelous job in designing this sailing yacht, indeed. That´s it for now as a single text would be too much for you to read through. Within the next week, Part 2 of my Interboot impressions will feature Jeannaeu, Hallberg-Rassy, Dragonfly and Schöchl Sunbeam. As well as a small boat made by a virtually unknown yard. Klick here for Part 2. 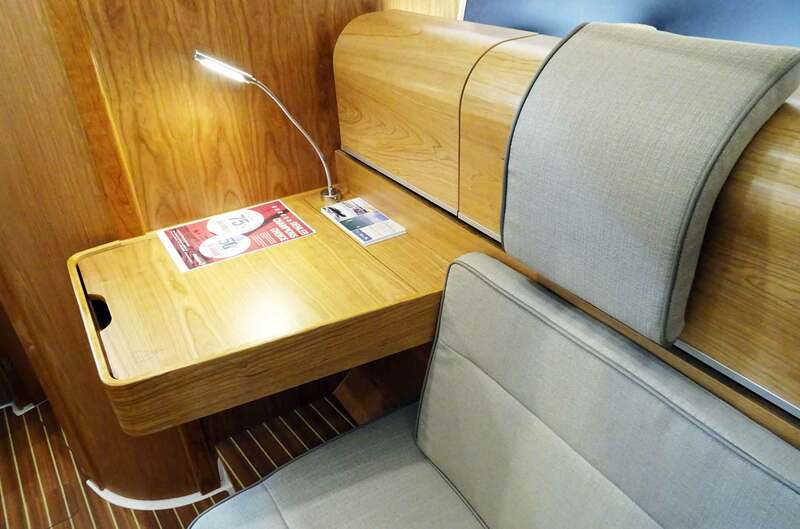 Interested in sailboat interior design? Here´s a visit on the Hallberg-Rassy 412 and 43. 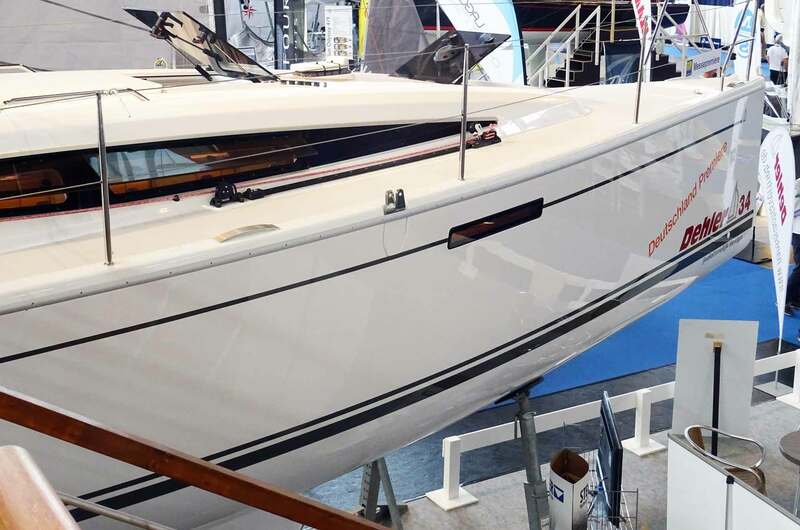 Another dream yacht – the Pogo 12.50: Fast as hell and quite something different. Design and seaworthiness? Read more about this one here. Your pictures and description are of a Beneteau 41.1′, not a 45’ which explains why you found it smaller than you would expect. There are many different color combinations for the wood, wall coverings and cushions possible to ensure the decor is what the owner likes.